Bah! Humbug! I know I'm totally un-American and such but I wish all those elves on shelves would just fall off! I don't want an elf creeping around my house at night doing things I wouldn't dare let my children get away with, do you? That 3-letter acronym that means almost the same thing as "what the crap?" would be appropriate here but my husband forbids me to use it in my writings. Calm down, you're almost as bad as him! It's just a word. You peeps have made it what it is today...infamous! Anyway, I've seen so many of those boring elf pictures on facebook I'm sick of them already and it's only December 6th. Now, if you have an elf and L.O.V.E. him/her, please take this post in the vain it is written in which is jokingly or humorously for the more intelligent folks. Yay, I'm in one of my moods today. Beware if you dare to read on. I want to slap that smirk right off your face. Who says you can look at anyone with that knowing grin like you're always chanting in your pointed little head "I'm the Elf on a Shelf, I can do anything I want and get away with it sucker!" I hate the elf for the smirk on his face. His/Her arms and legs are more toned than mine! I hate the elf because he lays around for 11 months of every year and never gains an ounce. I hate the elf because he has no feet. I know I'm the "Happy" Handicap. I admit I have feet problems or a lack thereof. My husband always says I make everything about me but seriously why would you make an elf, give him hands and not make him any feet. I almost feel sorry for him on this one but instead of sympathy, I prefer to just hate the footless little guy. I hate the elf because his creator went to my alma mater. If the idea was floating around on campus, why didn't it land in my head? Why didn't I get to become popular and make millions? Why isn't a creepy little elf I created sitting on the Kardashians' mantle? Yep, I hate the elf because I didn't think of him first. I hate the elf because short elves got no reason to live. They got little hands, little eyes, they sit around telling great big lies. They got tiny little teeth and a pixie haircut that stinks! My daughter is going to comment on this and say that I'm not really this mean but today....I AM! Leave me a comment and let me know why you hate the elf or you may just want to say why you hate me. Whew! I was curious how this blog was going to turn out. I'm glad it's not what I was dreading. Haha. We love our FuFu. He is a little boring this year with a new baby and all, but he is still magical! hahaha! Not sure what you were dreading unless you thought I was going to go the religious route! Not sure that would have worked with the word "hate" in the title either. lol FuFu is part of your family and that's the way it should be! I don't hate the elf but he isn't in my house. Cute post. I never noticed the lack of feet. Enjoy Sharefest. 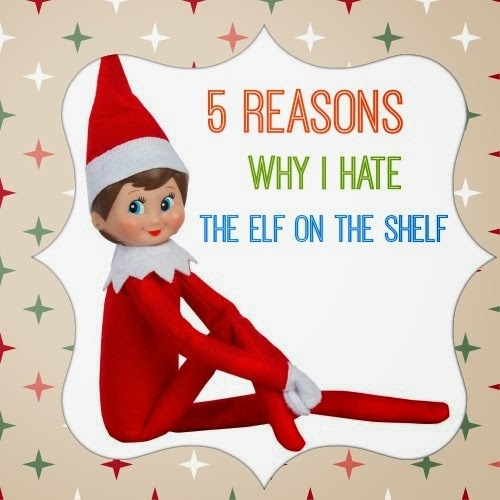 I really don't "hate" the elf either! Just thought it was a funny topic. Thanks for stopping by. We aren't a fan either. We have one, but she's creepy. And my son keeps commenting how she has no feet. It's just weird. HAHAHAHA! I'm just glad I'm not the only one who noticed the elves are feetless! Thanks for stopping by.